Previous studies that measured the natural frequencies and damping ratios of conifer trees were reviewed and results synthesized. Analysis of natural frequency measurements from 602 trees, belonging to eight different species, showed that natural frequency was strongly and linearly related to the ratio of diameter at breast height to total tree height squared (i.e., DBH/H 2). After accounting for their size, pines (Pinus spp.) were found to have a significantly lower natural frequency than both spruce (Picea spp.) and Douglas-fir (Pseudotsuga spp.). Natural sway frequencies of de-branched trees were significantly higher than those of the same trees with the branches intact, and the difference increased with an increasing ratio of DBH/H 2. Damping mechanisms were discussed and methods for measuring damping ratio were presented. Analysis of available data suggested that internal damping ratios were typically less than 0.05 and were not related to tree diameter. External damping was mainly due to aerodynamic drag on the foliage and contact between the crowns of adjacent trees. Analysis of data from previous wind-tunnel studies indicated that damping due to aerodynamic drag is a nonlinear function of velocity. Damping due to crown contact has been suggested by a previous author to be a function of both the distance to and the size of adjacent trees. Therefore, in uniformly spaced stands it may be possible to model crown contact damping as a function of stand density index (SDI), a common forestry measure which incorporates both of these variables. This review was made possible through funding from the Department of Forest Resources at Oregon State University and the New Zealand Forest Research Institute Ltd. 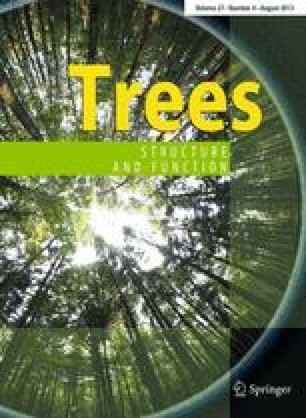 The authors would also like to thank Mr. Martin Sugden for allowing his data to be used, and Mr. Bruce Nicoll for his assistance in obtaining the data from the British Forestry Commission’s tree pulling program. Drs. Daniel Edge, Barry Gardiner, David Hann, Michael Unsworth, Solomon Yim and two anonymous reviewers provided useful comments on an earlier version of this paper.